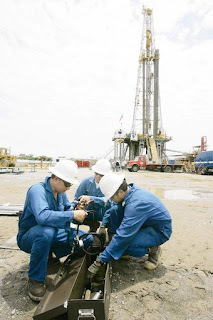 * Unconventional natural gas deposits are difficult to characterize overall, but in general are often lower in resource concentration, more dispersed over large areas, and require well stimulation or some other extraction or conversion technology. Extremely large natural gas in-place volumes are represented by these resources, and the US has produced only a fraction of their ultimate potential. * Shale gas is defined as natural gas from shale formations. The shale acts as both the source and the reservoir for the natural gas. Older shale gas wells were vertical while more recent wells are primarily horizontal and need artificial stimulation, like hydraulic fracturing, to produce. Only shale formations with certain characteristics will produce gas. The most significant trend in US natural gas production is the rapid rise in production from shale formations. In large measure this is attributable to significant advances in the use of horizontal drilling and well stimulation technologies and refinement in the cost-effectiveness of these technologies. Hydraulic fracturing is the most significant of these. * The consulting firm ICF forecasts that tight gas, coalbed methane, and shale gas will make a major contribution to future North American gas production. Unconventional gas production is forecast to increase from 42 percent of total US gas production in 2007 to 64 percent in 2020. Despite the current economic conditions, the long-term need for US natural gas should be strong enough to support these anticipated future production levels. * With the tremendous success of the Barnett, Fayetteville and Woodford shales in the United States, the gas shale resource base will play a major role in the future natural gas production on which the nation will depend. Already the Barnett Shale gas play in Texas produces 6 percent of all natural gas produced in the Lower 48 states. Recent announcements of emerging plays in Appalachia, Northern Louisiana, British Columbia, and South Texas indicate the widespread potential of shale gas resources across North America. Each of these shale gas basins is different and each has a unique set of exploration criteria and operational challenges. * The Potential Gas Committee, an incorporated, nonprofit organization that consists of knowledgeable and highly experienced volunteer members who work in the natural gas exploration, production and transportation industries issued its biennial assessment of the nation’s gas resources in June 2009. This study indicates that the United States possesses a resource base of 1,836 Tcf of natural gas. When combining these results with the Department of Energy’s latest determination of proved gas reserves, 238 Tcf as of year-end 2007, the United States has a future supply of natural gas of over 2,000 Tcf. At current consumption rates, this is enough natural gas to supply the nation for the next hundred years. This is an increase of more than 35% when compared to the Committee’s 2006 assessment. This increase is largely attributable to increased supplies from unconventional gas plays, specifically from shale gas development. * In its April 2009 report, "Modern Shale Gas Development in the United States: A Primer," the US Department of Energy stated that at the US natural gas production rates for 2007 of about 19.3 Tcf, the current recoverable resource estimate provides enough natural gas to supply the US for the next 90 years. Separate estimates of the shale gas resource extend this supply to 116 years. Production of shale gas is expected to increase from a 2007 US total of 1.4 Tcf to 4.8 Tcf in 2020. The DOE report states that shale gas production potential of 3 to 4 Tcf per year may be sustainable for decades. The INGAA report stated that to achieve the forecast results, industry must have land access for drilling, a reasonable permitting process and adequate prices and demand for natural gas. * In November 2008, the Interstate Natural Gas Association of America (INGAA) published a report, "Availability, Economics and Production Potential of North American Unconventional Natural Gas Supplies," that included an updated resource base for natural gas in the United States and Canada. The INGAA study states that the assessment of shale gas potential in the United States and Canada is a work in progress and there is a long way to go to understand remaining potential and implications for future natural gas production. The advance of drilling and well completion technologies, including hydraulic fracturing, has opened up plays in a number of different basins that were not previously considered to have economic potential. The volumes calculated for gas-in-place are extremely large, and a small difference in the estimated percentage of gas-in-place that is recoverable has a huge impact on estimates of recoverable resources.